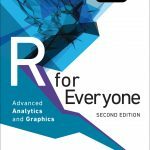 This page is dedicated to R for Everyone: Advanced Analytics and Graphics, my book from Addison Wesley, now in its Second Edition. Here you will find links to information from the book including the table of contents, packages used, data and corrections. It will be updated over time so keep coming back. It is available at many other stores so check with your local book store. There is a corresponding video available too! The lesson on building scatterplots with ggplot2 is available on YouTube. Another series of videos , covering XML data,, data.table, dplyr, Rcpp, recommendation engines, text mining, network analysis and web graphics, plus an update on using rmarkdown. Pearson has posted Chapter 12 “Data Reshaping”, online for free.